Subhash Risbud got his B.Tech degree with honors in Metallurgical Engineering from the Indian Institute of Technology in Bombay (1969), and M.S. (1971) and Ph.D. (1976) degrees in Materials Science and Engineering from the University of California at Berkeley. His work experience includes positions as a Researcher at the Lawrence Berkeley Laboratory (1970-71 and 1974-76), Policy Manual Writer at TIA (1970), Crystal Grower at Stanford University (1971-73), Process Engineer at GTE-WESGO (1973-74), faculty member at the University of Nebraska (1976-78), Lehigh University (1978-79), University of Illinois at Urbana (1979-85), and University of Arizona in Tucson (1985-90). 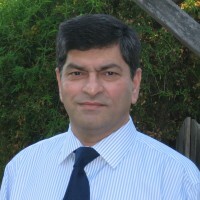 Since 1990 he has been on the faculty of the University of California at Davis. He has served as the Department Chair (1996-2002) and is currently the Blacutt-Underwood Endowed Chair and Distinguished Professor of Materials Science as well as the Director of the Internship and Career Center at UC-Davis. He also holds the position of Visiting Professor at Stanford University (2002-present). Risbud has an outstanding reputation in the science and engineering of ceramics and glasses. The work in his group has led to significant impact on technological applications of ceramic materials and graduates of his group have successfully advanced to important positions in industry, national laboratories and universities in the U.S. and abroad. His work on phase separation in silica-alumina glasses and supercooled liquids of compositions close to mullite was definitive in delineating phase boundaries that served as guides for engineering products like mullite refractory castables, aluminosilicate fibers, and glass-ceramics. He was among the early pioneers of research on oxynitride-oxycarbide glasses, ceramic matrix composites and semiconductor quantum dots in glasses. His more recent work has branched into femtosecond pulses to modify glass structure and optical properties, spark plasma sintering of nanoceramics, 3-D imaging of quantum dots, silica xerogel/aerogel platforms for biological structures, and superconducting ceramics. His collaborative work has resulted in about 275 publications and seven patents, and the book Introduction to Phase Equilibria in Ceramics (co-authored with C.G. Bergeron) His expertise as a consultant has been useful to solve manufacturing problems in processing glass syringes, cullet recycling in glass container and fiber manufacture, development of gradient index glasses, and ceramic substrate technologies. Risbud is the recipient of the American Ceramic Society’s Ross Coffin Purdy Award for Outstanding Contribution to Ceramics Literature (1979); the Xerox Award for Faculty Research at Illinois (1984); Fulbright Lecturer Award (1987); Outstanding Educator Award of the American Ceramic Society (1998); the Norbert Kreidl Award from the American Ceramic Society (2002); and the UC Davis Distinguished Teaching Award (2008).